Joshua Walker, Rino Anto, Thoi Singh, and Beikhokhei scored goal apiece to keep Bengaluru FC undefeated against Sporting Clube de Goa. Sporting kicked-off the game from left to right, they looked keen for an early breakthrough through their comeback man Odafe Okolie. Bengaluru FC missed the services of midfielder duo - Siam Hanghal and local lad Shankar Sampingiraj, away with the India Under-23 team playing the AFC Championship. The only Karnataka connection in both the starting eleven was in Hubballi boy, left full back of Sporting Chinta Chandrashekar Rao, who had a fairly decent outing. Disaster struck Sporting in the 22nd minute when skipper Anthony Wolfe tumbled and fell on his left shoulder along with Curtis Osano. He was stretchered out of the ground and replaced by Marcus Masceranhas. The much awaited goal came in the 32’ minute from a sublime freekick from super consistent Eugenson Lyngdoh which Joshua Walker headed to perfection. Crowd witnessed glimpse of vintage Odafe in the first half, he flummoxed Bengaluru defense only to find keeper Lalthuammawia Ralte with several brilliant saves. After changing ends, Bengaluru made their intentions clear, kept attacking from the right flank, which Sporting failed to plug. Another attack from the right flank, build around Sean Rooney, right full back Rino Anto came from behind, attacked the ball and put calmly to the goal. 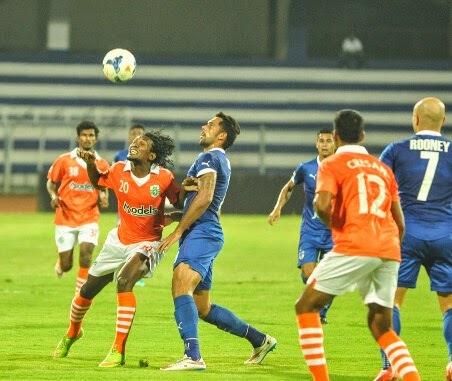 Thoi Singh and Beikhokhei joined the goal scoring party in the 60th and 80th minute of the game. Sporting Clube reduced the margin 82nd minute through Victorino Fernandes. The travelling ball on goal was not cleared to perfection by John Johnson that ultimately ended at the back of his own team’s net. Keeper Lalthuammawia Ralte was awarded the played of the match.